Artist Robert L Davis was born and raised in California. He received his Masters of Music at the University of the Pacific. While teaching music in the San Francisco area, he began persuing his aspirations toward artistic expression and has continued throughout his life. In 1965, Robert moved to Santa Barbara, California with his family where he continued his music instruction at Santa Barbara City College. 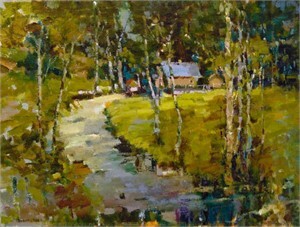 Robert L. Davis now devotes all his time to his first love, oil painting. Davis has studied with such artists as Helen Dooley or Carmel, Kenneth Nack of Santa Barbara, Robert Frame of Santa Barbara and most recently, Ted Goerschner of Santa Ynez, California. 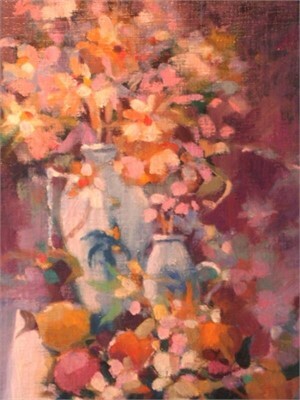 The still life and landscape paintings of Robert L. Davis are found in art collections throughout the United States. 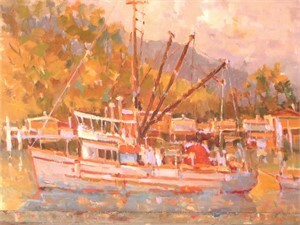 Artist Robert L Davis was born and raised in California. He received his Masters of Music at the University of the Pacific. While teaching music in the San Francisco area, he began persuing his aspirations toward artistic expression and has continued throughout his life. In 1965, Robert moved to Santa Barbara, California with his family where he continued his music instruction at Santa Barbara City College. Robert L. Davis now devotes all his time to his first love, oil painting. Davis has studied with such artists as Helen Dooley or Carmel, Kenneth Nack of Santa Barbara, Robert Frame of Santa Barbara and most recently, Ted Goerschner of Santa Ynez, California. 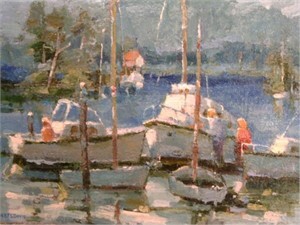 Robert paints from life and “en plein air”. 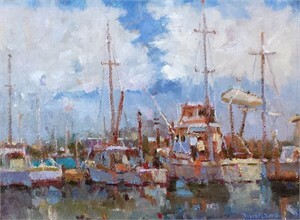 He states “I am drawn to reflective waters, harbor images and mountain landscapes. I enjoy painting when the early morning sunlight and late afternoon shadows are a constant source of mood and light.” The still life and landscape paintings of Robert L. Davis are found in art collections throughout the United States.